concrete. 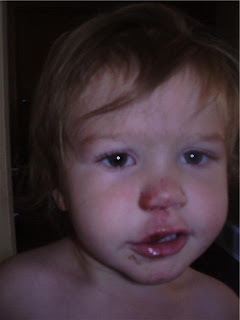 She busted her lip open, and had "road rash"
that is my tough girl!! 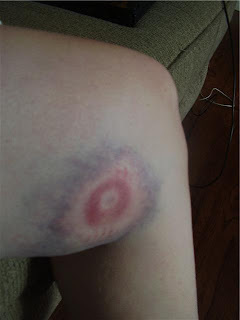 by a softball, and this is my bruise the next day. Doesn't it kind of look like a bulls-eye??!!! Good for you posting this grotesque picture (but it even looks worse in real life), it shows how tough you are. You should be PROUD. Lainey- not so much. That is just plain sad. Holy moly those look so painful! I can't believe Lainey hardly cried. Wow you guys are tough. You asked if we have any Utah trips planned and we do! I'm so excited. We're coming the end of Oct. We found some good tickets so decided to come before Tayson turns 2 so we don't have to buy him one =). Oh my goodness, how could you post this without a warning in case some poor unsuspecting pregnant woman with really strong gag-reflexes saw it? :) Doesn't surprise me about Lainy though, you always were a tough tomboy and I was a crybaby! Oh, by the way, you win. I didn't give the bloggers out there enough credit when I posted something about a craving. Guess you're just more perceptive.